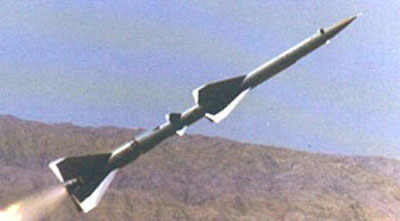 The Iranian CSS-8 (M-7) is a short range, solid fueled, ballistic missile. It is believed Iran acquired 200 of the CSS-8 (M-7) from China in the late 1980s. Iran later renamed the system Tondar-69. The missile has a range of 150km (93 miles) and carries a payload of 190kg. This missile is also capable of carrying a nuclear warhead. The CSS-8 (M-7) is designed to launch from a tracked launcher vehicle; thus, as a road mobile system, the CSS-8 (M-7) can be launched from any location. Although the CSS-8 (M-7) entered into service in 1992, it may soon become obsolete as less than 100 of the missiles are in operation since only 20 tracked launcher vehicles are in service. Furthermore, the system is reported to have poor accuracy. Given the CSS-8 (M-7) short range (150km) and poor accuracy, it poses a limited threat to the Middle East. Missile Threat. “Tondar 69 Missile Threat.” Last modified November 3, 2012. http://missilethreat.com/missiles/tondar-69/. Andrew Feicker. “Iran’s Ballistic Missile Capabilities.” Congressional Research Service (2004): pg 1-2. Accessed April 10, 2014. http://fpc.state.gov/documents/organization/39332.pdf.